Greetings fellow Sacred 2 Enthusiasts, this it the place where we would appreciate comments regarding any of your problematic or bothersome experiences playing the Completed Community Patch 160 (not the Beta, please). If you have any inexplicable glitches such as failed quests for no reason, missing or incorrect items, or things designated as changed in the release notes that do not appear to be present as expected, please address them here. Thank you in advance for staying on topic, so as to make it easier to respond to any reported issues promptly. Your assistance in helping us to improve your gaming experience is appreciated. Interesting, the very same error Androdion had once, at the same general location. Must be some kind of a weather effect in the area, I guess. By the way, do you use the original physxExt.zip, or the one from the patch? Yeah, and the same PhysX library too. Which Nvidia drivers do you have Dhampir113? I recently updated to 388.59 with PhysX 9.17.0524, do you have the same version of the drivers or an older one? Do you run any custom settings on the Nvidia Control Panel? In all honesty my game only crashed once in 26 game hours after 1.60 saw its final release, and it was precisely in that place and with the same error report. I think I can live with that though as the next time I did the same route after a game reload nothing strange happened. Nvidia drivers 388.59, PhysX 9.17.0524, physxExt.zip from the patch. NVIDIA control panel > Manage 3D settings > Global Settings > Power Management Mode > Select "Adaptive"
Your driver version is the same as mine, so I suspect the PhysX crash was probably due to that. I never had a PhysX crash during the Beta testings but when it went into final stage I did update my GPU drivers so it could (should) be the cause. If you're getting that kind of behaviour then it's probably got little to do with the patch. Are you on Windows 10 by the way? I've seen some users complaining about a similar thing on Steam, games not running properly and all. Moved recent crash reports to this thread. 1. when xanthiar the dragon gets to 50% hp left its stops attacking happened 3 times so far with my seraphin, in bronze silver and on another toon. might be a bug on my end don't know never happened before. 2. after opening the door in the quest wet danger "Octagolamus" , I went and did the free stat point quest's that were added to cm patch, when I came back the door was locked and could not open it to kill the boss, reloaded and that did not work. what did is I presses in the water area where the boss is and she walked through the large rock. that worked after killing the boss. now the rock is gone. a glitch on my end ? Doesn't he just start flying around like he is running away and then lands away from you? I've never seen him stop attacking, even killed him a couple of days ago. That flying-landing CA I believe is a bugged "Dive" attack. Doesn't seem to do anything but is basically harmless. Nothing changed about Xanthiar/Ordaurcil (both dragon use the identical creature entry) in CM 1.60. I just checked all the scripts and everything seems in order. He should be a powerful boss. Bear in mind the boss cam doesn't exist anymore. As for the 4 hit kill, what attacks were you using, and what level were you and the Dragon? My bad I haven't played in a while, forgot I had survival mod instaled while I was playing cm 1.50, disabled it, the dragon appeared again as a boss now. No problem. Seems many bug reports the last few weeks are from people using mods. It's a relief, at least once we learn the cause, to know there's nothing wrong with the patch. I will try to update as many old mods as is feasible for CM 1.60. Its just the first 3 potions you get from the chest when you start a new game that wont stack, not realy a big deal, try progressing through the game I think every other healing potion will stack to 99. Yeah, potions and runes now stack to 99, and you can drop them and catch them again to "restack" them so to speak. But only potions and runes from the same difficulty level will stack though, so when one changes difficulty the new ones will be separated stacks. Hope this helps. First of all....many thanks to all member of the CM-Patch team to hold alive my favorit game! Now I has to come with a issue that I see on my laptop. When I start the installer...the message down appears! It was possible to procces the installer, but after some time the installer terminates with an error. The game starts with CM 160 but not with all changes. This message is in fact not an error. It is the way, Windows tells you, that some registry entries are already there. 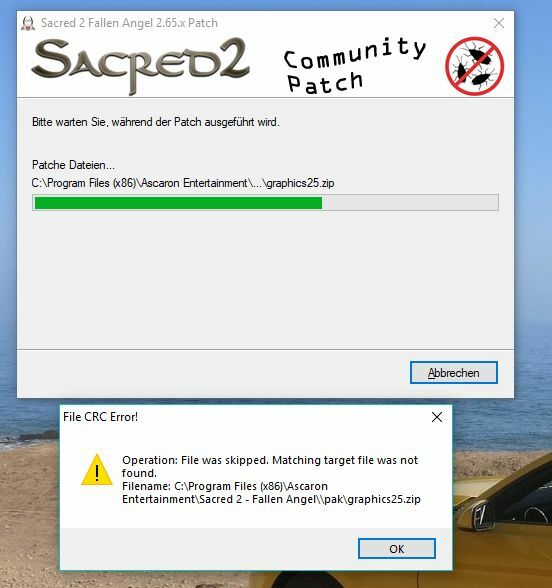 The CM Patch 0.160 sets the two files "sacred2.exe" and "s2gs.exe" to run in Adminstrator Mode. Windows 10 itself sets these files to run in Admin Mode, then you first start Sacred2. There are some compatability tests done and Windows sets these registry entries for you. Don't ask me, why Windows can't give a proper message like: "The Registry Entries already exists." (in german this would be "Die Unterschlüssel wurden bereits erstellt." or something like this. What do you mean by "not with all changes." What exactly does not work or does not appear? Have you any kind of memory cleaner installed? 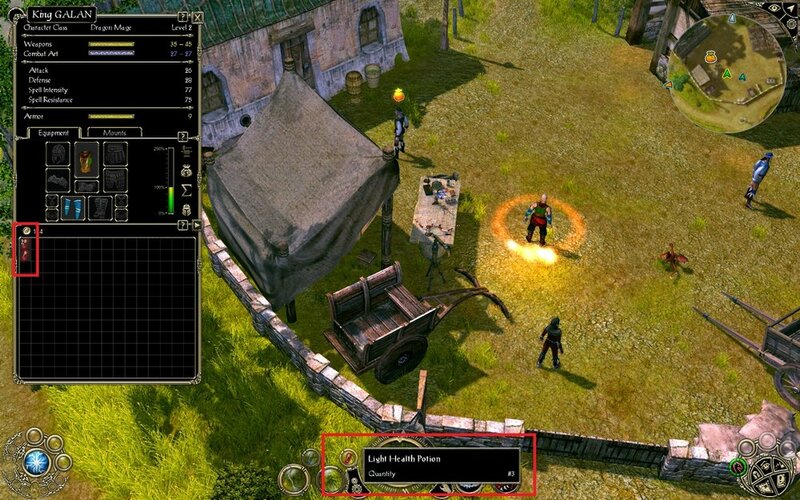 And, very important: exclude the complete Sacred 2 game folder in your anti virus. The popularity of the CM Patch may be big within the community, but we are - in fact - a very small community. And therefor, the overall usage of this specific file is very limited. To avoid your anti virus to interfere with the CM Patch, exclude the game folder from scanning. I had an issue with the CM Patch 0.150, there all text was gone due to my anti virus. My experience was, that it is the best choice to a start a fresh character with the new CM Patch. The only anti virus is win defender. The patcher terminats with the message attached. 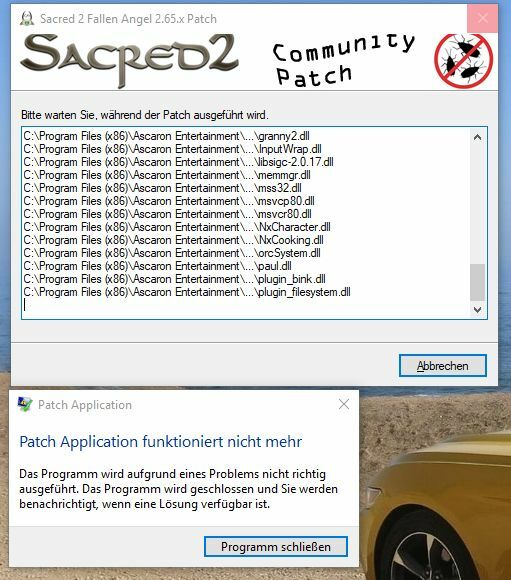 That's why I think the patch is not completely installed.